Thank you for attending 2018 Annual Membership Meeting in San Diego, CA. We request that you share your feedback on the meeting with us by taking our survey, sent by email to all attendees. This should take no more than 5 to 10 minutes of your time. The Conference Committee will reference this information when planning future meetings, so your feedback is very important! Check out some photos from the event of sponsors, attendees, and more! IKECA is an American National Standards Institute (ANSI) accredited standards development organization. The Consensus Body is comprised of volunteer leaders who represent a wide variety of industry stakeholders. This year’s meeting will continue to advance the production of the draft ANSI/IKECA M-10: Standard for the Methodology for Maintenance of Commercial Kitchen Exhaust Systems. Stop by and pick up your registration materials. Don’t forget to look on the back of your name badge to learn what team you are on for the Team Building Exercise and your group number for the demo sessions. Kick off this year’s Annual Membership Meeting by meeting up with fellow members and meeting new members and attendees. Enjoy cocktails and light hors d’oeuvres. Swing by and pick up your registration materials, including your badge. IKECA merchandise will be available for purchase during registration hours. Neal Iorii, CESI, Olympia Maintenance, Inc.
Join President Iorii to kick of this year’s Annual Meeting. New members and prospective members in attendance will be recognized during this time, as well as our valued sponsors/exhibitors. It’s a new world and the marketplace has changed. Choices are vast and quality abounds! Being great at what you do is no longer a differentiator — It is merely the entry fee. Today, winning in business is about discovering, creating and leveraging competitive advantages. In this highly entertaining, thought-provoking and actionable presentation, based on his new book: Visibility Marketing, business marketing and branding veteran David Avrin, CSP will show you and your team how to discover, create and promote meaningful differentiators to gain visibility and earn customers. How to discover, reveal or craft meaningful competitive advantages. How to move beyond mere competency and create a visible chasm between yourself and competitors. Why nobody wants to be the “best kept secret” and how you can become known for what you want. How to leverage a new generation of creative marketing strategies and tactics to dramatically boost your visibility. support you through their participation in IKECA! We are told that there is no “i” in team but there is. Each individual on your team is important and if each was provided the opportunity to give their best; how well would the team perform? Be the “i” in team is not about Individualism it is about Influence. This session will be about maximizing the influence you have as a leader and each person on your team has on the overall success of your organization. Learn about getting the best from your team members and recognizing the I’s on and in your team. This meeting is IKECA’s Annual Business Meeting. Members of the board will provide members and attendees with an update on the association, its programs and services by way of committee updates. Come check out what your association is doing for you! Jim Roberts, CECS, CESI, Derby Pressure Wash, Mario Abab, CECS, CESI, Air Cleaning Technology, Randy Conforti, CECS, CESI, Precision Kleen, Inc.
AHJ session is for Code Officials, Facility Managers, Building Owners, and Insurance personnel. Discussion will be had on new codes, standards and technologies that apply to kitchen exhaust systems, cleaning and maintenance. The session will begin with cooking appliance inspections, the top 10 list, UV technology and highlights of the C-10. It will conclude with round table discussions with industry guests. The greatest source of lost revenue for your business is the prospect you never knew about and you have no idea how many prospects you are unknowingly driving to your competitors. So, how do you earn and keep customers when patience is short and alternatives are only a short drive or a click away? In this hard-hitting and entertaining presentation, popular Customer Experience expert David Avrin, CSP will shine a light on the monumental shift in buyer behavior and expectation, while showing your team everyone’s role in eliminating barriers, engaging prospects and creating Customer Experiences worth sharing. How to see all the choices available from the customers’ perspective. How stories of lost opportunities at every level reach the masses and why it matters. How missed moments, and maddening policies are contributing to lost sales and negative reviews. Why differentiation trumps competency and connection earns sales. Join this session to understand the objectives and goals of the team building exercise. This is your opportunity to meet your team captain and fellow teammates prior to Friday’s event. Join us to celebrate the life of one of IKECA’s founding members Bernard Besal. The evening will begin with a personal tribute to Mr. Besal followed by a reception. All are welcome. This is the last day to purchase IKECA merchandise while in San Diego! Join fellow attendees over breakfast and take some time to visit our valued exhibitors. Break out and explore your surroundings with our IKECA Photo Scavenger Hunt experience! Teams will be given creative photo retrieval challenges and will need to present a unique team presentation of their findings, at Friday’s Delegate Lunch. The IKECA Photo Scavenger Hunt is the ideal program for the development of new friendships and for strengthening the bonds of existing relationships. Interact and Energize – This fun, visual exploration will have participants convene to build new relationships while making quick decisions to perform as a unit to earn points. Problem Solve and Innovate – Deciding as a team what the best strategy will be to give them the best chance to score points will showcase the teams’ ability to come together and plan. Engage and Have Fun – Get the most out of your meeting experience by breaking out of the traditional meeting setting and having some fun! A power point presentation reviewing pertinent NFPA codes, which impacts an exhaust cleaner in the field. Discussion will be had on the data needs of KEC companies and how to move from spreadsheets to using relational databases to provide the information you need to run your business. A custom KEC Customer Relationship & Profitability Manager database will be made available to attendees at no charge, along with the advantages and disadvantages of using this system versus off the shelf or custom built systems. In addition, IKECA committee informational sessions have been added to this year’s rotation of focus groups. Learn about the different committees you can join, along with the importance of volunteering. This year, attendees will move from room to room based on their group number, found behind their name badge. Grab a bite and enjoy some networking time with fellow members. Discuss topics from the sessions, get some advice on how to tackle a challenging business situation, or seek out a volunteer leader to learn how to get more involved with IKECA. AHJ raffle winners will be announced and scavenger hunt presentations will be given and judged. This will be your final opportunity to catch up with an exhibiting partner. Jim Roberts, CECS, CESI, Derby Pressure Wash, Randy Conforti, CECS, CESI, Precision Kleen, Inc. This session will be a continuation on the topics discussed during Technical Code & Review Part 1. Communication is key to customer engagement. From sharing data about the services you can perform to sharing data about the services you will or have performed for them. Communication is your connection to your customer and how you communicate will define your relationship. IA will share how data can be a foundation of your communication strategy and why it is the new need for consumers. We will also discuss why fancy words and visuals cannot hide poor communication practices and why your credibility now relies on the quality of your communication. We will also discuss strategy to communicating negative issues and handling negative feedback and turning these issues into positive communication plans that will end up enhancing your credibility and your business. We will wrap up the discussion with examples of consistent communication and how even the most egregious errors will be forgiven with proper communications; as long as the expectations set are followed through. There will be a Q&A session with the IA Team to discuss communication challenges. Choosing the right software tools to help manage your business can be confusing. Do you need an Accounting Systems? Do you need a Scheduling Software? What about CRM? Should I choose Quickbooks, Peachtree or something more robust? What does ServiceCEO provide that Service Trade does not? Do I even need an integrated system and can I measure the Return on Investment? This session will be about how to understand the right choice for your business. How to ask the right questions and how to know if the company your considering is asking you the right questions. 95% of all ERP failures happen during implementation and on-boarding. After this session, you will be armed with the information to make good system choices and know what to expect when you make your final choice. Joel Berkowitz, CECS, Fireproofing Corp. of America, John Muller, CECS, ASCS, Airways Systems, Inc.
Join us for a last meal before heading home. Advanced registration is required to sit for an exam. Good luck to those sitting for an exam! “I would like to say thank you to all those involved in the recent IKECA conference. I enjoyed the conference and had some great takeaways that will be very helpful. I thought the tribute to Barney was tremendous. David Avrin was one of the best keynote speakers I have ever heard in 30 years of attending conferences. I walked away with several pages of notes from his two sessions. The team building scavenger hunt was a great opportunity to get to spend time with and get to know IKECA members. Thank you to everyone who attended IKECA’s 2017 Annual Membership Meeting in Charleston, SC! Attendees gathered at the Charleston Marriott for two full days of educational sessions, exhibits, and networking. A formal color guard from the Charleston Fire Department kicked off Thursday’s sessions, with AHJs from many local and regional fire departments in attendance for a day of education. This year’s event featured several highlights, one of which was a keynote and workshop delivered by Todd Wangsgard of FranklinCovey. Todd’s presentations focused on 4 core strategies for building loyalty and 3 key loyalty principles – empathy, responsibility, and generosity. Additionally, there were panel discussions that discussed Fire Inspections, including the processes and outcomes from the viewpoints of ALL parties involved, as well as how to protect yourself and your company when a Fire Claim moves to litigation. In addition to Thursday’s high-quality educational sessions, attendees were able to enjoy several networking opportunities with peers, exhibitors and friends. A special thank you to Diamond Partner IA Business Advisors for sponsoring Thursday evening’s outdoor reception! We are proud to report that IKECA members and attendees continued tradition by graciously donating funds to support a local fire department. This year’s donations totaled over $1,460 to support local AHJ initiatives! Brian Smith, PhD, of IA Business Advisors, lead Friday’s Keynote where he discussed high-level communication and management strategies that enhance employee retention to move a companies toward success. Friday’s focus groups from Gold Partners DRIPLOC, Ductmate, IA Busienss Advisors and Omni Containment exposed attendees to new products and services. Robe Hove of Vent Tec presented a system for evaluating customers to keep track of customer profitability. Past IKECA president Jack Grace lead an informative Town Hall highlighting Board of Director responsibilities to end the meetings education sessions. IKECA is an American National Standards Institute (ANSI) accredited standards development organization. The Consensus Body is comprised of volunteer leaders who represent a wide variety of industry stakeholders. This year’s meeting will continue to advance the production of the draft ANSI/IKECA M-10: Standard for the Methodology for Maintenance of Commercial Kitchen Exhaust Systems. Attendees interested in the process are welcome to sit in as an observer; each person will be asked to sign in and formally introduce themselves during the meeting. CEUs are not awarded for observers. The IKECA Board will convene to discuss association business. Board meetings are not open to general attendees but members are welcome to submit a request to be heard by the board. The deadline for such a request would be April 7. Join President Rauth to kick of this year’s Annual Meeting. New members and prospective members in attendance will be recognized during this time, as well as our valued sponsors/exhibitors. Attendees will enjoy a special welcome from Charleston-area AHJs! FranklinCovey’s customer loyalty expert, Todd Wangsgard, will provide inspiring best practices in measuring customer loyalty and developing key loyalty-building behaviors among IKECA members and employees. Grab a refreshment and visit with our valued exhibitors and sponsors! Join Gary to learn more about how to select a kitchen exhaust air pollution control system and what you should know before you buy. This session will provide an overview of the types of kitchen exhaust hoods in the market place from the Basic Filter hood through to Water wash UV with ESP. It will also address the code requirements driving the use of thermostats to start the exhaust fan through the various types of demand control ventilation. Last, we will cover some of the latest changes in the upcoming NFPA 96- 2017 related to fire suppression in systems with multiple hoods and pollution control units. This training session is exclusively hosted for local and invited AHJs. Now that we’ve heard the theory and research behind the four cores strategies to build customer loyalty, it’s now time to find out how to apply it back at the office. This facilitated workshop will provide you with the tools necessary to fully advance your customer loyalty strategy. Your Customer Has Had a Fire…Now What? A panel lead discussion on Fire Inspections including the processes and outcomes from the viewpoints of ALL parties involved. Gain an understanding from the experts of their roles in investigating a fire from the moment a fire occurs to the point of potential litigation. The panel includes a Charleston Fire Inspector, an Attorney who has litigated for both sides, an insurance Claims Specialist as well as the owner of a KEC company who has been involved in fire litigation. What are the steps in determining cause and origin and how each group achieves their determination. What role does the KEC company play in the investigation or can they be an active participant. Is there a “Mutualistic” approach to fire investigation? Does each party share or rely on the information of the other investigators? Designed to give attendees insight, knowledge and understanding of the steps involved to better prepare for not if, but when a fire happens! I Did Nothing Wrong, Why Does My Insurance Company Want to Pay the Claim?? This session is designed to answer your questions regarding your Rights and Responsibilities and how you can protect yourself and your company when a Fire Claim moves to litigation. Richard Shaw from RCMD will moderate a panel of experts who deal with the litigation and settlement of fire claims. Panelists include a Litigation Attorney and a Claims Adjuster. They will discuss the claims process from fire to litigation, the different types of liability and how liability is assigned and what the KEC company should and should not be doing throughout the process. This session is not to be missed…what you don’t know can hurt you! Randy Conforti, CECS, CESI, Precision Kleen, Inc.
You’ve heard of David Letterman’s Top Ten, now join two of IKECA’s top presenters to hear our Top Ten! Learn more about the C10 Standard, how to put it into practice and the Top Ten List for Commercial Kitchen Inspections. This session will delve deep into the C10 Standard and provide attendees with IKECA’s Top 10 List of must know’s for not only the Kitchen Exhaust System but all of the systems and components that must be inspected. Gain an understanding of what service providers should be doing and some of the issues they encounter when doing their job. This session is designed to shed light on the myriad of potential fire and safety issues that may be lurking in a commercial kitchen but may not be apparent when doing a site visit. Attendees will walk away with the IKECA Top Ten List and knowledge that may assist them in their inspections! Attendees will enjoy beer, wine and cocktails with some great food, all compliments of IA Business Advisors. Network with fellow attendees and be sure to visit our sponsors/exhibitors whose support makes these events possible! Multiple sponsor/exhibitors will lead quick, 20-minute vendor demonstrations that will allow you to get to know more about their programs and services. Be sure to check back for more information on participating vendors. One of the biggest benefits in attending the IKECA meeting is the time spent with your peers. Utilize this time to not only refuel but to build a new professional relationship! Last chance to visit with our exhibitors! The always popular and very well-attended review is perfect for anyone wanting to brush up on NFPA 96 and ANSI/IKECA standards. This session will discuss the strategy of building teams to move a company forward. It will identify why employees should be included in all company communications on a regular basis. Why, employees should be empowered and held accountable in a pragmatic way. Why owners and manages should look at employees as people not assets. And we will look at how Individualism can be a company’s best way to a total Team Environment. Rob will present a system to keep track of customer profitability, how to relate customer data to your existing financial statements, and how to rank customers with financial and non-financial criteria, all specific to the KEC industry. We will develop a method for calculating your minimum acceptable price for existing customers, your ideal target price for new customers, and then discuss proper pricing strategies for your company and situation, and the nexus between price and quality. This session, moderated by Past President Jack Grace, will feature questions from our membership to past and present Board of Directors members. 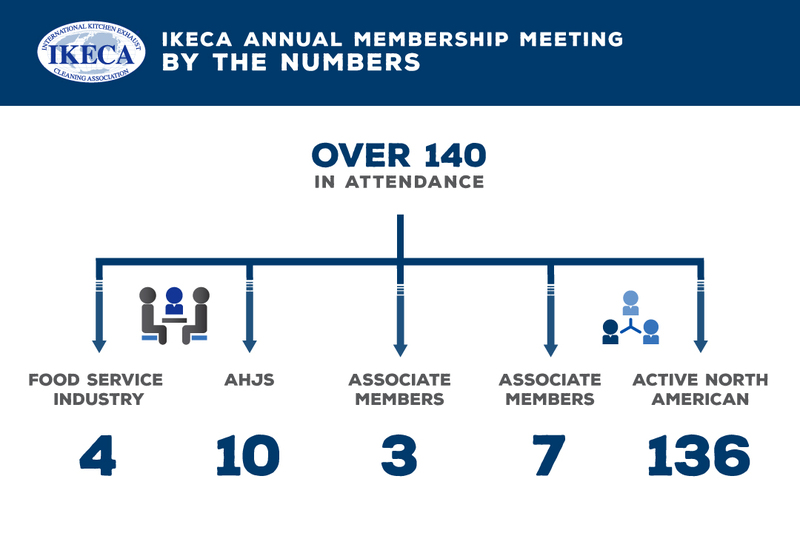 Learn about what the IKECA Board does for the Association and what Board members have learned from their service to IKECA. IKECA will host a testing session for anyone wishing to sit for any IKECA certification. Study materials will be available for purchase or loan at the IKECA registration desk. Thank you to everyone who attended IKECA’s 2016 Annual Membership Meeting in Portland, OR! Attendees gathered at the Embassy Suites by Hilton Portland Downtown for two full days of educational sessions, exhibits, and networking. This year’s event featured several highlights, including keynote speaker James Cathcart from FranklinCovey. He shared two captivating presentations focused on methods to help companies perform to the highest level and how to gain strategic advantages. Thank you to 5-Star Sponsor, Really Good System, for sponsoring a book for all attendees to take home with them which expanded on the keynote presentation! “I always pick up several actionable ideas from the Annual Meeting that can improve our business. This year, the annual savings from one of these changes more than covers the convention costs” – 2016 IKECA Annual Membership Meeting Attendee. Attendees were able to benefit from unique opportunities to hear from key constituents in the kitchen exhaust cleaning industry. ANSI Consensus Body Chair Barney Besal, CECS, CESI was joined by a panel of expert AHJs who led a presentation on the C-10 and I-10 Standards and how they are implemented in their own jurisdictions. Additionally, Rick Martin, PhD, PE, CFI, CFPS of Martin Thermal Engineering, Inc. presented from a testifying expert’s perspective on insurance-driven fire investigations to help arm attendees with greater knowledge about important factors that investigators deem important to determine the cause and spread of a hood/duct fire. These were only a few of many valuable presentations at the event, be sure to check out all of the sessions online for more details! In addition to the high-level educational sessions, attendees were able to enjoy several networking opportunities with their peers, exhibitors and old friends throughout the event. A special thank you to 5-Star Sponsor, Altus, for sponsoring an additional dessert reception on Thursday evening! We are proud to report IKECA members and attendees continued tradition and graciously donated funds to support a local fire department. This year’s donations totaled over $1,300 to support a local Portland fire department! Trust is hard, real, and quantifiable. It measurably affects both speed and cost. A function of character and competence, trust can be created and destroyed, effectively taught and learned. In most cases, lost trust can even be restored. This fast-paced and engaging presentation dramatically reveals TRUST as the hidden variable that will become your most leverageable tool, giving you a distinct strategic advantage. We call it “Leading at the SPEED of TRUST.” Read more here. Approximately 8,000 restaurant fires occur each year in the U.S. with property damage alone exceeding $240,000,000 annually. Many restaurants close their doors after experiencing a fire because rebuilding and re-establishing takes too long or is too costly. Too frequently, fires occur after restaurant owners attempt to cut expenses by reducing the frequency of hood and duct cleaning and/or fire protection equipment servicing. This presentation gave attendees an inside perspective on how insurance-driven fire investigations are conducted, so they can be armed with greater knowledge about factors that testifying investigators deem important to the determination of cause and spread of a hood/duct fire. Also presented were common misconceptions about the ignition and propagation of grease fires. Thursday, 12:00 pm – 1:30 pm (0.15 CEUs)This year’s Annual Membership Meeting welcomed a new President, Randy Rauth, CECS, and bid farewell to the current President, Kathy Slomer, CECS. ANSI Consensus Body Chairman, Barney Besal provided an overview of key components of IKECA’s newly released standard, ANSI/IKECA I10-2015: Standard for the Methodology for Inspection of Commercial Kitchen Exhaust Systems and how this support fire prevention and life safety efforts. IKECA AHJ members shared how they have incorporated IKECA standards in their jurisdiction and how their membership has positively impacted their efforts towards fire prevention and life safety. Facilitated by FM Moore, FM Marshall of California and AFM Davidson of South Carolina, each brought their own unique experience on implementing stricter standards, leveraging the education and relationships found in IKECA, to advance the cleaning, inspection and maintenance of commercial kitchen exhaust systems. Do your employees know your organization’s top priorities? What would an IKECA meeting be without team building? During this event, attendees participated in a fun, interactive session that allowed them to get to know their fellow IKECA members a little better and get moving after a long day of education. This was the official after-dinner gathering spot for meeting attendees! An evening of networking and fun was generously sponsored by Altus. Cocktails flowed and dessert served thanks to Altus! What is this SHARP program all about? What can it do for my company? How can my company participate? This session explained this OSHA Voluntary Compliance program, its origins, how it works, and what it can do for your company and your employees. 20-minute focus groups were developed for exhibitors to quickly introduce a new product or service and/or get feedback from customers in the field. These quick, interactive sessions helped attendees learn more about IKECA’s valuable vendor partners. Rnady Conforti, CECS, CESI and Jim Roberts, CECS, CESI went over the ANSI/IKECA C-10 & I-10, NFPA 96, ICC Codes and key other standards important for anyone working in the field. Past President, Jack Grace, lead an interactive conversation focusing on modern challenges in communication, from texting and cell phones to cloud based service programs. How is your business handling the 24/7 demands of communication?This member-to-member exchange helped attendees gain insights to implement upon their return to the office. BizVision outlined the principles and habits that separate a successful organization from less successful ones. Understanding these will help owners and managers reach their personal and company goals, as well as training those who will assist them in attaining those goals. With local competition, sophisticated customers, and a changing local economy, responsibility for increasing employee performance is one of the most critical concerns of companies. Owners and managers who empower employees to higher levels using the BizVision Management Methodology see efficient operations and a company that meets or exceeds its goals. The Compliance Engine is a simple, web-based service for code officials to track and drive code compliance and provide safer communities through third party inspection reporting and maintenance. This session covered a full overview of The Compliance Engine program, the value of the partnership between IKECA and TCE, and how TCE impacts the members of IKECA in their service regions. Being recognized by a prospect can be the difference between winning and losing business. While there is a lot more to sustaining business, getting doors open still requires a marketing plan. Marketing has grown beyond yellow pages, door flyers and even direct referrals; today coordination of traditional marketing and digital marketing must be made to maximize a companies opportunity to be visible. This discussion reviewed some of the traditional aspects of marketing and outlined how social media and other digital marketing options can be employed to dramatically increase return on investment. The discussion also reviewed how to understand digital marketing and how to actually compute return on investment in a digital and social world. The meeting featured even more opportunities for education, professional development and networking through topics which included employee retention, employee management, motivation and incentives. President Kathy Slomer, CECS, will kick off the meeting with a state of the association update. We will also welcome and recognize new members, first time attendees and sponsor/exhibitors. With an increasing demand for service employees and the continuing problem of a lack of job readiness, exploring best practices to attract, train, motivate, and retain 2015 service employees that create a stable workforce is essential. You will leave the session with at least fifty low cost or no-cost ways to motivate your employees. Take some time to visit with our exhibitors and learn more about their products and services. Team Building sessions have become very popular within IKECA. Not only do they offer attendees the opportunity to get to know a fellow IKECA member, they also get ideas to take back to their offices to build stronger, more cohesive teams. This year’s team building will take place in two parts. During this morning session attendees will participate in a rapid-fire question and answer session that will allow your team to gain a competitive advantage for Part 2! Please join us for the Annual Memebership Meeting and lunch to get an update on the current activity of YOUR association. Committee Chairs will provide an update on their recent accomplishments and plans for the year. This training covers the basic components of an exhaust system, explains the importance of a full and proper cleaning and provides attendees with tips and tools to conduct and improve inspections. Seperate registration required, learn more here. The second part of the IKECA Team Building session will get attendees out on the beach for a competitive second half. Don’t worry, we will give you time to get into your beach gear! Generously sponsored by ServiceTrade, please join us for an evening of networking and fun, set along the Intracoastal WaterWay. Cocktails will be flowing and heavy hors d’oeuvres will be served thanks to ServiceTrade! Join fellow attendees over breakfast and take some time to visit our exhibitors. Facilitated by Nancye Combs, members will participate in roundtable discussions centered around six different employee issues. Members may choose any topic and will change tables every 15-minutes to cover at least six different topics. The Table Host will moderate the discussion and offer his/her own experience as the discussion starter. During the final fifteen minutes, the Table Hosts will provide a brief summary of new or unusual contributions made at their table. 20 minute focus groups were developed for exhibitors to quickly introduce a new product or service and/or get feedback from customers out in the field. Join these quick, interactive sessions to learn more about IKECA’s valuable vendor partners. Enjoy the final networking luncheon. This is a great opportunity to exchange ideas with fellow attendees or take some time to meet with an exhibitor. This is the final opportunity to catch up with an exhibiting partner. Don’t miss learning from two of the KEC industry’s most knowledgeable individuals about ANSI/IKECA C-10, NFPA 96 and other standards. This is a must-attend session for anyone planning to sit for an exam either onsite in Ft. Lauderdale or in the coming months. How to apply quality management concepts to managing employees. Which comes first; great employees or a great company? Is it a chicken and egg situation, or can one develop the other? We will discuss! Progressive discipline establishes a consistent policy that owners and managers can utilize to address employee behavior issues. We will review the discipline process; what is discipline, how it functions, what consequences companies, owners, managers and employees face if appropriate and prompt discipline are not taken. Every business owner would like to find a way to motivate staff and increase profits. Every owner asks, “How in the world can I provide financial incentives when I’m not making a profit?” Come to the presentation and leave with new ideas on how to create a win–win environment with your staff AND increase profits. There is your incentive to come! Thank you to those that attended IKECA’s 2014 Annual Membership Meeting in Las Vegas, NV! We gathered at the Golden Nugget for two full days of educational sessions, exhibits, and networking. Long time members and new members congregated to celebrate 25 years of IKECA to look back with great pride at the many accomplishments of this Association, as well as look forward with an even greater sense of purpose. The Annual Membership Meeting was a celebration of our past while taking steps into our future. A future where we promote kitchen exhaust cleaning to a higher standard. Check out what new associate member and first time attendee, Peter Rahage of Protien Matrix, has to say about his experience as a sponsor and exhibitor at the 2014 Annual Meeting. – We would like to extend a warm and heartfelt thank you for a great conference. As new members and first time exhibitors we were very impressed with IKECA and it’s Membership.We humbly thank you for your overwhelming support of our new Green Chemistry products line “Uncle Oscar’s F.O.G.Control”. We look forward to seeing you all again at the IKECA technical conference this fall and Ft. Lauderdale next year. The 2014 Annual Membership Meeting featured two keynote speakers, Croix Sather and Tim Paulsen. These two speakers presented on topics such as: growing your business fast, business neuro-strategy, and negotiation techniques. Please see below for more information on these speakers. Croix is an internationally celebrated author and inspirational speaker in the field of personal transformation, business strategies, and the psychology of success. Paulsen is a professional speaker located in Toronto, Canada. He is a past-president of The Canadian Association of Professional Speakers and has presented programs in 22 countries. Thank you to all of you who were able to join us for the IKECA Annual Meeting in San Francisco, California! For those who were not, we want to be sure that you are well informed about the exciting information and events which took place and help us all reach our goal of cleaning to a higher standard – Our membership was honored to have Mr. Barney Besal present the work of the ANSI committee that has become the IKECA ANSI C-10 Standard. With this document, the higher standard that we speak of has been codified and is now a living blueprint of exhaust cleaning best practices – If you have not yet ordered a copy of the standard, you may do so at the IKECA website as copies are now available for purchase. Additionally, we were honored to have Halton Company introduce their new grease duct safety monitoring system, truly an innovative device to help contribute to life safety and aid end users and Authorities in better understanding the need for cleaning exhaust systems. We are sure to be encountering their technology in existing systems as well as new installations worldwide! Our members were also treated to a visit from Chef Bob, the ‘Short, Fat, and Happy Chef” and inventor of the DragonFire thermo recovery grease filtration system. Chef Bob gave a lively and informative talk about this innovative new method of capturing and reusing heat waste from cooking appliances. Be sure to visit both of our presenter’s websites to learn more about their systems. Finally, I would like to extend a special thanks to our exhibitors and sponsors, listed below. They are truly an integral part of the meeting whose support is key in allowing IKECA put on conferences. Be sure to consider them in your future orders! This is truly an exciting time for IKECA and all that our association has worked to accomplish – IKECA is YOUR association – your participation and engagement in committees, educational outreach, and of course your commitment to cleaning to a higher standard is what makes IKECA thrive – I sincerely hope that you will get active and involved and thereby take advantage of being a part of this great association. Four teams submitted their findings from the team building adventure held during the 2012 annual membership meeting. They were asked to submit a presentation of no more than 20 slides, using 10 pictures from a list. Check out their submissions!